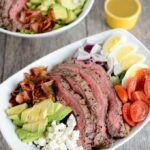 This Steak Cobb Salad Recipe is packed with protein and nutrients, easy to assemble and makes a great lunch or dinner option as the weather gets warmer. Combine first 8 ingredients in a ziploc bag and let marinate at least 4 hours or overnight. Remove steak and grill to desired doneness. Let rest and slice into strips. Put 2 cups of lettuce in each bowl. Top each with bacon, feta, tomatoes, onion, egg, avocado and steak, arranging as desired.